I am glad to participate in this year’s edition as my friend’s guest, Nieves Veas. I am so sorry because I cannot attend to the event Artwave Festival 2013, like I did last year, due to the fact that I should stay in Spain because of work. I hope you like my paintings. Below, I briefly explain to you the reason of each work. Tesauro Collection to watch alone. They are 13 little, numbered and signed boxes with the following motives: flowers and little branches. 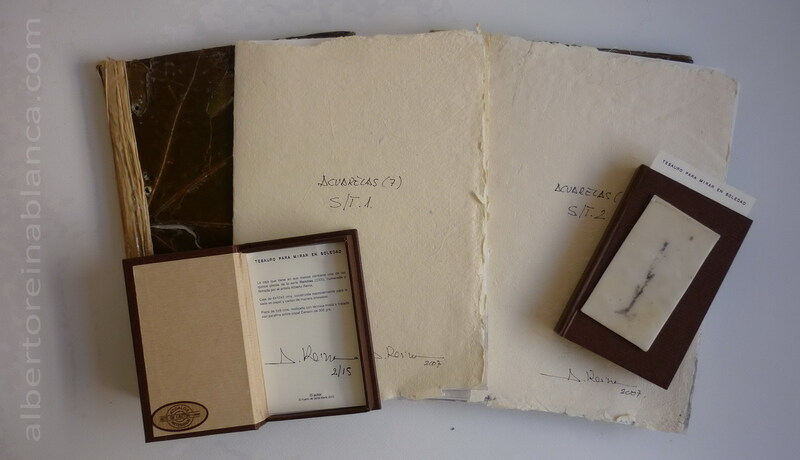 Flowers: 3 boxes which are numbered and signed by the author Alberto Reina (1, 3, and 5). 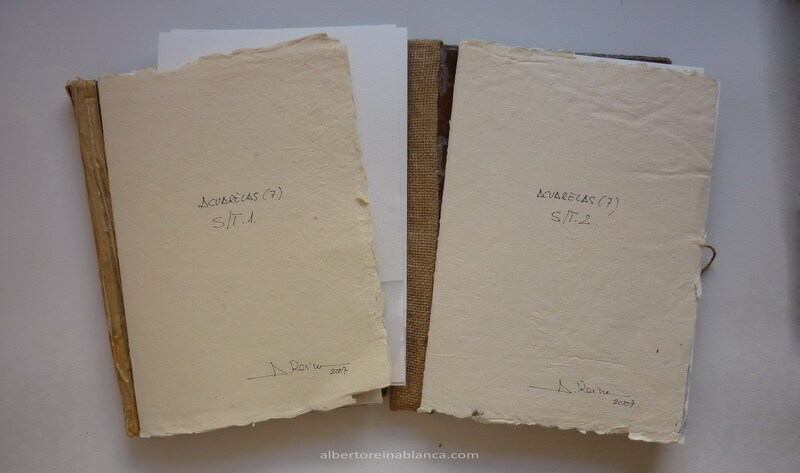 Little branches: 10 boxes which are numbered and signed by the author Alberto Reina (1, 2, 3, 7, 9, 10, 12, 14 and 15). Inside: 5×9 cm piece, made with a mixed technique and treated with paraffin in Canson paper 300 grammes. Box: 8x12x2 cm, specially handmade built for the paper and cardboard serie. Like the soundbox that I open only for me, the little picture that I bring with me, the book I read in darkness with little light which only lights up the page of the book, a silent moment, the place where I go when I feel good….or blue, like a little secret. Thus I show these little boxes were born, like a little craving to watch alone. Watercolor collection s/t 1 and 2. 2007. Two handmade folders made with natural fibre and vegetable motives. 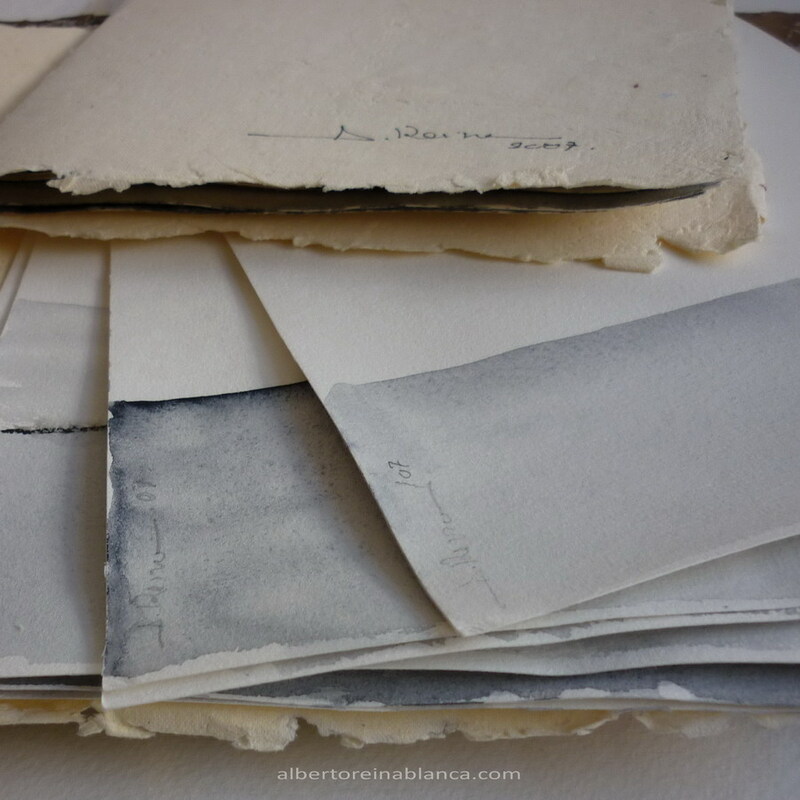 Inside: handmade recycled paper and 7 watercolor paintings (24×16 cm), numbered and signed by the autor Alberto Reina each one. This watercolor paintings were made in 2007. It should be said that they were directly influenced by Passenger silence: ten years of initiation in China, the book where Fabbiene Verdier, the author, narrates the ten years that she lived in China. (Salamanda, Barcelona 2007). She works with ink, but I used the materials I had on hand. In my opinion, the book was interesting, and now, I have found her web, that I highly recommend, to visit it, just click in her name. Just like that, I send greetings to all those people who are reading this letter. I feel grateful to be with you although it be with my little works. If you want, you can visit my web: paintings, paper, paraffin wax and singular work. Soundtrack to Lewes (Synaesthesia for everyone). Synesthesia, from the ancient Greek σύν (syn), “together,” and αἴσθησις (aisthēsis), “sensation”, is a neurological condition in which stimulation of one sensory or cognitive pathway leads to automatic, involuntary experiences in a second sensory or cognitive pathway. It is a subjective sensation of a sense other than the one being stimulated. For example, a sound might evoke perception of colour. This could awaken and merge senses in an involuntary manner. I wanted to explore with these sensations and to share the final result of it, with the experience felt from the music I’ve chosen for to play at Artwave. My aim was to evoke a musical sensation with a photo shoot. Also, I have tried to compose a unique and special soundtrack for these Lewes scenes. Hoping to motivate these sensations in you, I have organized this exhibition and these picture. I hope you can capture the experience of Synesthesia, as much as I have enjoyed the arrangement of this project. Furthermore, this year, I have also prepared some surprise for you.